The 2017 Spring runway is gearing up their playful colors that reminisce the anchoring earth tones of the 2016 Fall trends, and burst into new vibrant hues inspired by nature. Designers are finding inventive ways to bring greenery to the forefront and we cannot wait to see what they have in store for us this year. Check out some of the designers who are ahead of the game, and get a glimpse into what the future of fashion may behold. The solid color approach is contemporary yet reminiscent of the 70s mod trend. Paired with a neutral wedge, this outfit is cool and collected. Giving the color greenery the mic is one of the best ways to wear the color of the year. Without any embellishments or an excessive color palette, greenery can fulfill its expectation to resound one’s desire for new beginnings. Pair this bright yellow-green color with an equally playful pop of color. The golden yellow booties are the perfect match with this simple button-down collared dress. This dress exemplifies the organic fluidity of nature. The designer even pulls in floral embellishments to enhance the earthiness of the piece. This dress mimics the movement of foliage blowing in the wind. This luxurious assemblage is decadent and appealing to the eye. 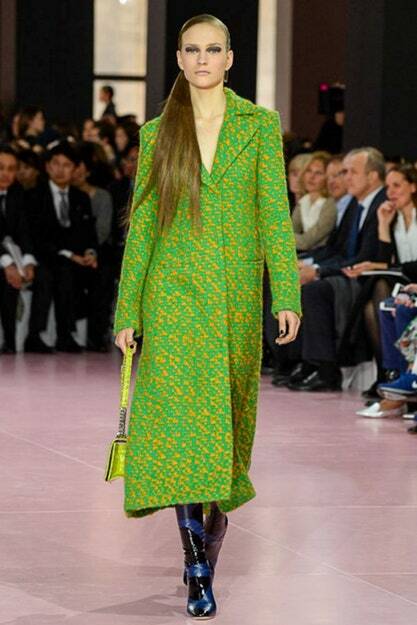 The green accentuates the prosperous nature of this look, and creates and awe-inspiring appeal. Here is another dress where the designer has relied heavily on the inspiration of nature for this piece. Creating a sense of rejuvenation and luxuriousness, the dress becomes a beacon of refreshing style and poise. Plus it looks absolutely stunning whilst billowing in the wind. You can never go wrong with greenery outerwear. Weather you’re embracing the flourishing outdoors or needing a pick-me-up in the bitter cold, this coat will not wrong you. Just for fun, we thought we’d show you some throwbacks to reference the decade that inspired us all, and clearly had some influence on Pantone’s Color of the Year choice. Show us your best dressed greenery. How would you pair this color with your style?